Howdy folks, welcome to the latest, long-awaited installment of the Adventures of JeannaDanger… and I’ll be honest…I’ve been up to absolutely no good! 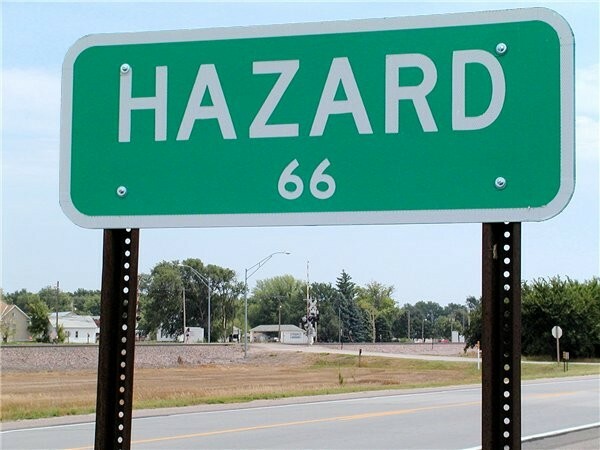 Went through Hazard, Ne. today, on one of my frequent jaunts across the grand, sparsely populated state I proudly call home, and had myself a bit of a giggle as I sent an encrypted message to one of my best friends – translating of course, into the courageous, lively tune of General Lee’s horn. 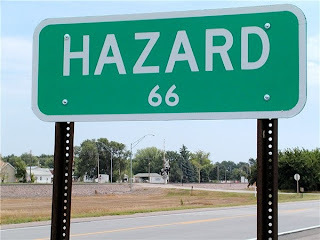 And of course, the posted population of Hazard would be 66… a tick away from being hellacious! (Ba dum chhhhh). Well, the primary reason, as sappy as it seems, for my aforementioned treks down Highway 2, would be to see the lovely face of my knight in shining camouflage, who swept me away in his big white pickup. However, reality prevails and I have a college degree to finish, so we’ve toughed it out the last few months, continuing the development of our relationship long-distance. And I say “toughed”, because he has limited phone service and no internet, and it takes 45 minutes and a 4-wheel drive to get anywhere close to civilization out in his neck of the hills. I have, however, become extremely adept at cooking glorious meals in his bare bachelor’s kitchen, and that is a whole ‘nother installment of its own. My dear darling knight is usually up to as much no-good as I am, which leads to us getting into a whole lot of no-good together. On one such occasion, my gun-toting country boy decided that we were going to shoot us a pheasant, and have him for dinner. I could smell the “uh-oh” on this one from a mile away, but not one to argue with a man holding a gun, I stalked out onto the sub-irrigated sandhills meadow with him. A flock flew up from behind the weeds growing out of the ditch and I plugged my ears just in time to save them from a shotgun blast. Feathers exploded and a dull thud proved his skillful aim. However, neither one of us were wearing overly waterproof shoes, and so instead of splashing through the two-foot ditch to grab the dead bird, he decided we would hike back to the pickup and drive out around the ditch to pick up his trophy. Again, not one to argue with the man holding the gun, we traipsed back to the pickup and drove out and around the long, winding ditch to hopefully get to the other side. We got around the ditch, but were still quite a ways from the pheasant when suddenly the pickup just sank. He gave it a little gas, but the tires just spun. His face went white and he immediately killed the engine. I know a little bit about getting a pickup un-stuck, so I shot him a puzzled look. He was very quickly out of earshot, or I would have continued to yell at him some more. Since we happened to be driving the caking pickup, every heifer on the meadow quickly sloshed through the puddles surrounding the sinking pickup and began to crowd up on the flatbed, sniffing for food. Worried they would cause it to sink even further, I spent a good fifteen minutes running circles in the water around it, shooing them away and throwing cake at them until they lost interest. We were a long danged ways from the house, so I knew it would take him a while to get back. The pickup was buried to the hubs in nasty, murky water, but it didn’t seem to be sinking any further. I found a mostly clean spot on the back of the flatbed and settled in to wait, shooing off any more curious bovines. Eventually I caught sight of his big white pickup coming in the gate on the opposite side of the pasture. Figuring they would only come in as far as the ground was solid, I started walking towards him. He’d brought the bossman along for help, and once they’d come to a stop, they both bailed out and started unloading multiple chains and tow-ropes from the bed. I grabbed a couple and started to string them out across the mud. It didn’t take long before we had everything hooked together and with a man in each vehicle, the engines revved and the pulling began. I ran off a couple hundred feet so that if a chain broke, I wouldn’t get smacked in the head. So, instead of hopping across a two-foot ditch and splashing his boots a little, my darling cowboy ended up walking four miles back to the house and sloshing through the puddles that soaked him to the socks. Hope he learned his lesson.